A recent study conducted by IPSOS in United States says more than 36 million people are obsessed with taking photos. Around 34 million are forced to delete pictures, videos and apps as they run out of space every week. And the impact is on 65 million US smartphone users every month. Britain is no different, YouGov’s online study (September 2015) reports 4 million people are addicted to taking pictures and over 4.5 million are forced to delete pictures, videos and apps on a weekly basis as they end up with low storage. From our recent survey on smartphone devices, we realized the most common problems as mentioned in the infographics. Please include attribution to remosoftware.com with this infographic. This result is not surprising, considering interest people show in taking photos. Losing precious photos is always a frustration, especially if your memories are attached to it. There are times, where we end capturing the precious moment, but mistakenly deletes it while trying to save storage space. You don’t want to end up losing your precious images while trying to reserve some space. Right? You never will. We decided to take it on. You don’t need to miss a single precious photo, instead, you can manage your duplicate photos that consume an average of 17% storage space. Remo Duplicate Photos Remover allows you to do that easily. IPSOS Research [September 2015] figures from North America. Analysis by studying 1004 adults, all representing US. Fieldwork was conducted on 19 to 21, September 2015. YouGov Research [September 2015] figures from YouGov Plc. The total subject size was 2047 adults. Survey was conducted online between 11 and 14 of September. 19% of smartphone users in US are forced to delete precious photos, videos and apps to make more space on their smartphones at least once per week. 17% of smartphone users in US are of the opinion, they often feel annoyed when they have missed a great photo opportunity. 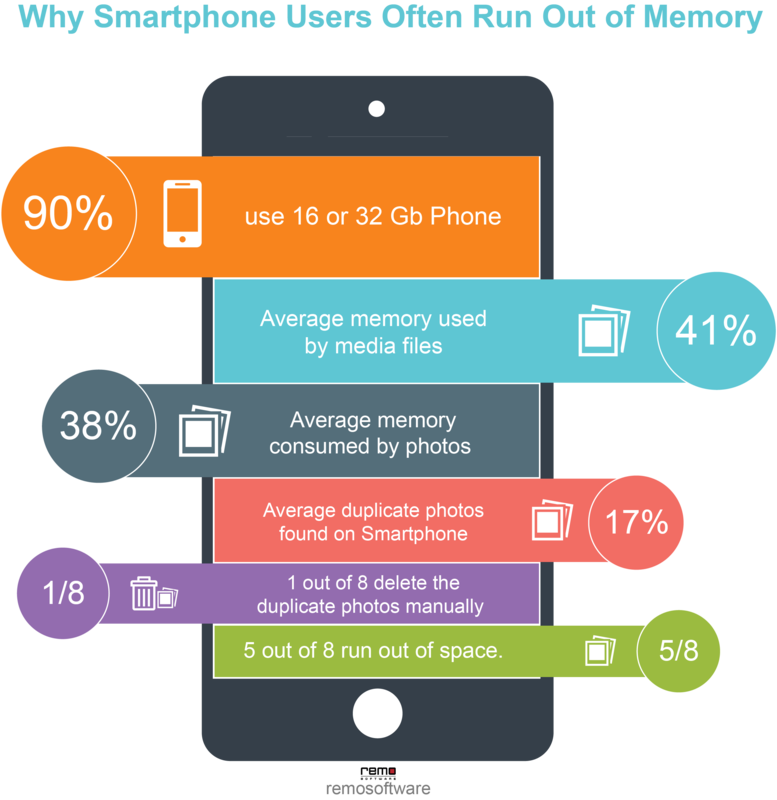 41% of smartphone memory is used by media files; 38% of total memory is consumed by photos only.